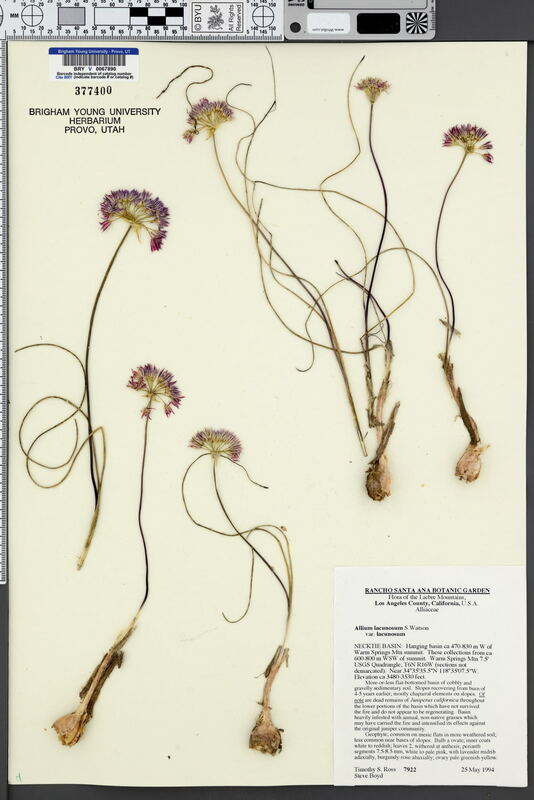 Locality: U.S.A., California, Los Angeles, Necktie Basin: Hanging basin ca. 470-830 m West of Warm Springs Mountain summit. These collections from ca 600-800 m WSW of summit. Warm Springs Mountain 7.5Õ USGS Quadrangle. Verbatim Coordinates: 34.59319 N 118.58541 W /// T6N R16W S .
Habitat: More-or-less flat-bottomed basin of cobbly and gravelly sedimentary soil. Slopes recovering from burn of 4-5 years earlier; mostly chaparral elements on slopes. Of note are dead remains of Juniperus californica throughout the lower portions of the basin which have not survived the fire and do not appear to be regenerating. Basin heavily infested with annual, non-native grasses which may have carried the fire and intensified is effects against the original juniper community. Geophyte; common on mesic flats in more weathered soil; less common near basin of slopes.